An overweight bee and a flower-headed caterpillar confirmed as playable drivers in the upcoming installment of Nintendo's famous kart-racing franchise. There are all manner of creatures in the Mushroom Kingdom -man-eating plants, pregnant squids, turtle monsters sporting healthy superiority complexes - but one set of critters has always been somewhat underrepresented: the bugs. Sure there were some armored beetles running around a cave or two in the earlier Mario titles, and no one is denying the small hoards of butterflies hovering about in the N64 version, but up until now, none of the arthropoda phylum have gotten much love in Nintendo's bevy of Mario spin-off titles. Well, all of that discrimination is finally changing as Nintendo is showing some love to our multi-footed friends by adding Wiggler and Honey Bee to the roster of Mario Kart 7. Much like Super Smash Brothers, and pretty much any Mario sports title, the Mario Kart series has always allowed for a large set of playable characters from the series' expansive, well-known universe. The newest installment, slated to go on sale December 4th for the 3DS handheld, is no exception. Nintendo already confirmed Metal Mario and Lakitu as new additions (though I'm still not sure who'll be starting the race now), and adds Wiggler and Honey Bee with the promise of other unlockable drivers still to be announced. Wiggler, the yellow stack of balls with a huge brown nose, has been staple Mario enemy since the days of Super Mario World. Best known for going from smiles to Hulk-rage in a matter of moments, Wiggler brings an interesting set of possibilities to Nintendo's racing franchise. Perhaps hitting her with a shell will turn her face that frightening shade of bright red and throw her into a maddening frenzy. Even if the effect was merely aesthetic, I still think it could work. 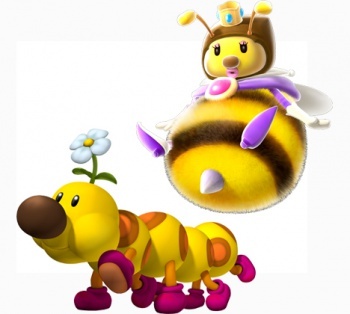 The other new contender is none other than Honey Bee, the gigantic, weight-challenged bumbler who first made an appearance in 2007's Super Mario Galaxy for the Wii. There's a bit of a size discrepancy for Miss Bee, as she was so large in Galaxy that Mario could scale her thorax like a big, squishy, mountain. Presumably, to make her fit, someone has hit her with a more permanent form of lightning bolt than the racers are used to. Mario Kart 7 will be available for the Nintendo 3DS on December 4th.